Following is the latest advice from the Australian Bureau of Meteorology regarding measurement of temperatures from automatic weather stations (AWS). This advice contains numerous errors of fact and is inconsistent with the information in an internal review issued just last Thursday. My responses to the inaccuracies in this document are prefaced with JM, and inserted herein. FAST FACTS: How does the Bureau measure temperature? 1. The Bureau measures air temperature using an electronic sensor (a platinum resistance thermistor) placed within a Stevenson Screen, and temperature is recorded every second. JM: No. The temperature is measured every second, it is not recorded every second by the Bureau. Rather, the Bureau has explicitly stated, most recently in an internal report released just last Thursday, that for each one minute temperature it only records the highest one-second temperature, the lowest one-second temperature, and the last one-second temperature – in that one minute interval. The Bureau does not record every one-second value. In the UK, consistent with World Meteorological Organisation Guidelines, the average temperature for each minute is recorded. 2. The air temperature fluctuates frequently on the scale of seconds. By using a sensor which has a longer response time than the fluctuations of the air temperature, the sensor “averages” these fluctuations. JM: No. Electronic sensors have shorter response times than mercury thermometers. So, to ensure there is no discontinuity in measurements when the transition occurred from mercury thermometers to electronic probes the maximum and minimum values need to be calculated from one-second readings that have been averaged over at least one minute. 3. Both the mercury-in-glass thermometers, and the electronic sensors, are housed within a Stevenson Screen. The time taken for air to be exchanged from the outside environment to within the screen provides a further time integration for the measurement of the ambient air temperature. 4. The response time of the sensor used in the Bureau AWSs is as long or longer than the changes in the temperature of the air it is measuring. JM: This may be the case. But the key issue has always been achieving consistency with measurements from the mercury thermometers – so there are no discontinuities in the temperature record with the transition from mercury thermometers to temperature probes. There was a report issued by the World Meteorological Organisation (WMO) in 1997 entitled ‘Instruments and Observing Methods’ (Report No. 65) that explained because the modern electronic probes being installed across Australia reacted more quickly to second by second temperature changes, measurements from these devices need to be averaged over a one to ten-minute period to provide some measure of comparability with the original thermometers. 5. This means that each one second temperature value is not an instantaneous measurement of the air temperature but an average of the previous 40 to 80 seconds. This process is comparable to the observation process of an observer using a “mercury-in-glass” thermometer. Are these methods consistent with international best practice? JM: The two claims made in this dot point are not consistent with published studies. As regards ‘these methods’, if this is an attempt at justifying an instantaneous one-second reading, then the answer is: No. .
6. The Bureau’s procedures comply with the World Meteorological Organization’s Guide to Meteorological Instruments and Methods of Observation (the CIMO Guide) WMO-No. 8 (2014 edition). The guide is available here. 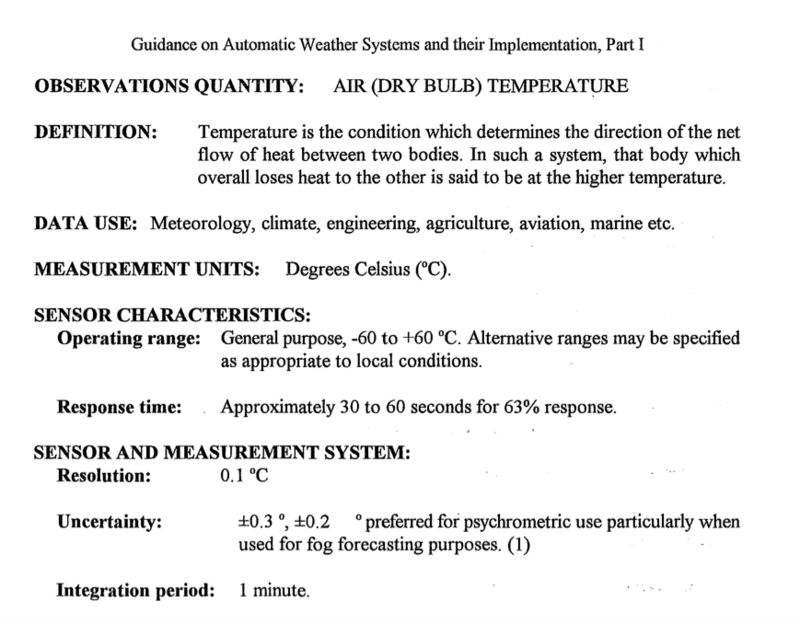 JM: The guide at the said link clearly states on page 540 (Part 2, Section 1.3.2.4) that atmospheric air temperature be reported as 1 to 10 minute averages. Therefore, the Bureau’s procedures are not compliant with WMO guidelines. 7. The guide recommends that temperatures be integrated over time to smooth out rapid fluctuations. There is more than one method of achieving this. The WMO guidelines do not prescribe which method to take. In its automatic weather stations the Bureau achieves this by using platinum resistance thermometers. These are comparable to mercury in glass thermometers. JM: No. The guide clearly states that readings from platinum resistance thermometers are not comparable with instant one-second readings from mercury in glass thermometers. In summary, given the Bureau is taking one-second extrema, rather than following its own published guidelines (Instruments and Observing Methods Report No. 65, WMO/TD No. 862) recordings taken by the Bureau over the last twenty years from automatic weather stations across Australia may not be fit for purpose. In particular, temperature measurements from Australia since at least 1990 have not been recorded consistent with calibration, and therefore are likely to be invalid? Jennifer Marohasy and Lance Pidgeon at the Goulburn AWS in early August 2017. Photograph courtesy of The Australian newspaper. This is a completely different thing to the sampling rate and averaging. It is describing the conditions BEFORE the one second sample rate not after. This time, specifies the curve which is not an average. To compare an exponential decay curve to an average is wrong. If the curve time was over 60 seconds then the most recent would have most of the influence while the oldest would only have the influence of three timeconstants (63 percent of 63 percent of 63 percent). A rule of thumb is that about 5 time constants need to pass before a reasonable measurement can be taken and 7 or more for an accurate measurment. So is the BoM also trying to hide that this (before the averaging) time constant is also too short by confusing 5, 7 and 1 time constants as “40 to 80”? And with reference again to the ‘Fast Facts’, it is sad that the Bureau do not appear to understand the difference between a thermistor and a platinum resistance thermometer. I write this because the document that Jennifer has posted begins with reference to a ‘thermistor’ and ends with comment about a ‘platinum resistance thermometer’. Uploaded by Jennifer on 14 September 2017 – for future reference. Apart from discrepancy Jennifer Marohasy is indicating there is other reason for concern about accuracy of global temperature measurement. Meteorological measurement and historical record of air temperature is now impacted by change to global wind speed caused by energy removed from wind by wind turbines, and also by impact of human induced change to ocean chemistry. 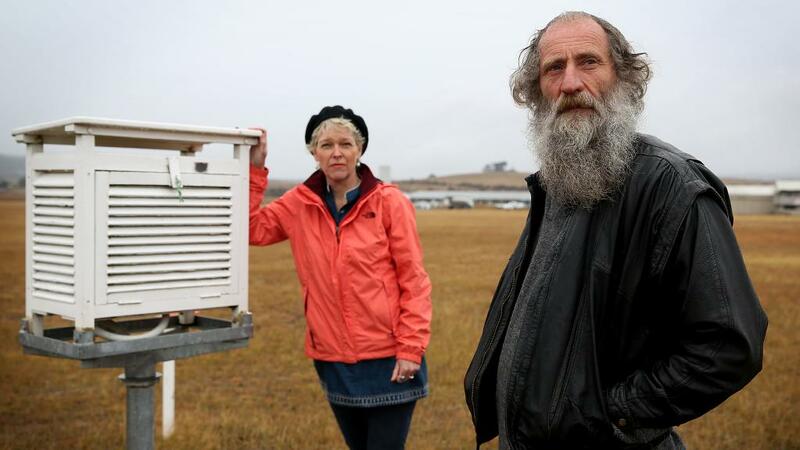 Very glad and grateful for the essentially unpaid but heroic efforts by Jennifer and others to hold the publicly funded custodians of our very questionable climate records to account. No amount of “good intentions” excuses this highly unscientific behaviour. See them wriggle and squirm! The UK Met uses PRTs in Stevenson screens and still averages readings over 1 minute. The BOM is NOT compliant and is desperately using semantics to try to justify its lack of credibility. The Bureau completely lost me at the very end when they stated that the probes are “comparable” to mercury thermometers. This is more than desperate semantics, this is lurching to nonsense. You make a good point about the UK Met Office putting its probes in Stevenson screens – I had just assumed everyone knew this! Of course, mercury thermometers and/or electronic probes (PRTs – platinum resistant thermometers) go in Stevenson screens. But the Bureau perhaps assumes we are fools (Minister Frydenberg included), and that if they perhaps just suggest that putting probes in Stevenson screens is a special thing, a clever thing that just they do… we will come to think this is part of their new way of “averaging”. I should perhaps have rammed home this point (that of course probes go in Stevenson screens) in response to their dot point number 3. Instead, of just writing ‘Noted’. So, to labour Ken’s point… of course, electronic probes and mercury thermometers both go in Stevenson screens. Go to this link and the first thing that you see, of course, is a Stevenson screen. Comments for this thread are now closed. JoanneNova.com.au will be posting very soon with more information on this issue. Jennifer, I notice that you have closed comments. Could I make a couple of comments? response time. One or two minute response would be fine. cones of wax and clay. I recall that one of the first experiments at Melb. University in the Chemistry lab. was to calibrate a mercury-in-glass thermometer. during calibration to be so far out in accuracy and variability I had to discard it. 1) The air is outside the Box. 2) It flows past the louvers. 4) It is converted to an electrical Voltage across the platinum resistance which is that resistance times the fixed current through it. 5) It travels down the four wire connection to where the first stage of processing is the linearisation algorithm. All quotes from the link below which is linked to from the BoM document “Fast Facts”. The BoM is claiming that the thermal time constant of the PRT probe in the sreen is the averaging but that occurs in the wrong part of this chain of events to have any effect on electrical noise. Surely the minimum thermal time constant of the Platinum Resistance Thermal Device (Device! ),due to true electronic noise, must be adequately located within the 1 min average? Moreover; it IS FAIR to say that not all variables such as atmospheric pressure, air temperature etc are going to have time constants within the 1 to 10 minute range. And readings are taken at a minimum resolution of one second intervals. Personally I would concentrate on the ‘….only Goulburn and Thredbo??! !’ issue. The time flow line issue is open to all sorts of nit picking which is never going to reduce to a ‘consensus’. BOM is playing a very cynical game here (one can almost imagine that this is all being run out of a special meeting room for narcissistic sociopaths) and gamble successfully (as per last time and the times before that) that obfuscation wins every time. What you are missing is that there is NO one-minute average. The Bureau are taking the last one-second reading and presenting it at their website as the ten minute average, and in this ‘Fast Facts’ as something equivalent to a one minute average. The UK Met office compute a one-minute average; the Bureau does not compute a one-minute average. 3. Homogenisation signficantly distorts temperature trends (often through the embedding of a UHI signal). Thanks Jennifer I had indeed forgotten that crucial point that there is NO averaging over one minute or indeed any other . How can they pretend to WMO that what they are doing is legitimate? UHI = (embedded) Urban Heat Island (effect)? This is great work you’re doing, please keep it up. It’s so gratifying to see someone who knows what they’re talking about taking on these people. From 10,000 miles away, in Brooklyn, NY, I applaud you wildly. Something else to remember is that long trend lines get drawn through data that started as In-glass inside a large Stevenson with that response time, Then the line goes through a small Stevenson period with a different response , then up to the present with whole different response mechanism. (what ever it is). The lines are then suppose to be proof of something. Question has anyone ever heard of or seen a “platinum resistance thermistor”? PRTDs are common especially Pt100 but does the thing they claim to use exist? I have seen the “T” used for either Thermometer or temperature but never platinum and thermistor together. “A resistance thermometer is not the same as a thermistor” Yes they are very different. Thermistors are cheaply made not really accurate and often have a negative temperature coefficient. Many are intended to run hot like the ones on old colour TV’s to demagnetise the tube. The number one issue for me is whether or not the new temperature record is directly comparable to the old one. The evidence so far is that the answer is no. A thermometer that reacts quickly will record short term temperature swings that a heavier and more slowly reacting thermometer does not. iii. Available for a fee. The scientific approach here would be to make this data available so that proper studies and appropriate conclusions can be reached. Also a full study of the time constants of all thermometers currently and historically in use should be made available. There is no doubt that the dominant factor driving near ground air temperature is for the surface to heat the ground and then the ground to heat the air. During the day this process leads to a constant churn of super heated ground air constantly rising in thermals and whirl-winds and being replace by falling cooler air. A thermometer with a short time constant will record much higher maximums than one with a long reaction time as it will pick up these pulses. At night the ground cools quickly and strong and stable thermal gradients establish with the cold and heavier ground air sitting below warmer upper air. As the air is now stable the time constant of a thermometer is generally not as critical. A very interesting observation here is that the Australian Antarctic temperatures which are currently measured by the same PRT probes seem to show no warming in over 50 years of recordings. This may be because there is no or little surface churn of the type described above and the temperatures there are consequently not nearly as sensitive to changes in the thermometer’s time constants. A Platinum (Resistor) Thermistor does not exist…what exists are PT100 (and PT1000) sensors which have a slightly nonlinear R(T) response curve with 100 Ohm corresponding to 0 degrees C. The change of resistance of a PT100 is tiny, about 0.00385 Ohm per degree Celsius, so you need an electrical amplifier to multiply the small corresponding change in voltage to a value acceptable by the datalogger (Thermistors have a much much greater resistance change per degree Celsius, but are more non-linear and more imprecise). An example of such an amplifier is the Phoenix Contact MCR-PT100 transceiver. Calibration of such a PT100 installation is done by replacing the PT100 sensor by a special PT100 calibration box, which contains an ensemble of fixed precision resistors representing standard temperatures: you choose for example the resistor which corresponds to 20 Celsius, and look if the output of the datalogger is 20 Celsius. Doing this, you integrate in your control the whole system of sensor, connecting wires and datalogger electronics. FWIW, it should be quite easy to design and set up a temporary gadget with a small micro-processor, a digital camera (or other optical sensor) with some simple software, and a 4G modem to simply register, record and transmit the temperature (as indicated by the height of the liquid in an LiG thermometer) from a few actual weather stations to a database. This data could then be analysed as required and compared with the data manually collected from the same station, and from nearby stations with newer technology. This would provide a way to bridge the differences between the traditional manually read LiG – based weather station data and that collected by later technologies such as thermocouples. A bit clunky, but it could help resolve the issues of manual reading and ToD errors, sensor thermal lags and inertia, etc. I built a chicken incubator once by putting a small lamp in a box. This idea you have would need to be outside the box and away from the box to not alter the way the box behaves. Electronics makes a lot of heat. Your steadfastness is paying off. It seems incredibly unlikely that the Australian experience is unique. The question is which will be the next country to be exposed as producing unfit temperature data? You’re making a real difference. Dr. Marohasy – At the end of this post you comment that the last 20 years of recordings from Australian automatic weather stations may not be “fit to purpose.” It occurs to me that this time span corresponds more or less to the “Pause” in observed global warming. I wonder how the Australian temperature record contributes to calculation of global temperature during the Pause. If in fact they are warmer than actual, perhaps the Pause was actually cooler than reported. Took a minute to remember, but don’t forget a stevenson screen is no magic device. it has its own bias due to its finish. The paint used has evolved over the years and has also changed/biased the data. 10 years ago this study was going on noting whitewash vs. latex finishes. The temperature data compiled by the Australian Bureau (the data I refer to in this blog post) is used by both the Hadley Centre in the UK, and NOAA’s National Climate Data Center in the US, to compile global statistics on temperature change. It is my assessment that the data used by these organisations from Australia for at least the last 20 years has not been collected consistent with World Meteorological Organisation guidelines, and could be classified not ‘fit for purpose’. It is unclear whether this issue of incorrect calibration – essentially what this blog post is all about – has significantly affected temperature trends. This will depend at least in part on how widespread the use of limits to ‘contain’ minimum temperatures is/was. The use of these one-second extrema (rather than averaging over one minute) will contribute, however, to more record high daily maxima temperatures – this is for sure. Indeed, the Bureau has continually reported new record high temperatures for locations across Australia over the last twenty years… as it has replaced mercury thermometers with these electronic sensors in automatic weather stations across the Australian landmass over the last twenty-plus years. Thanks to everyone who has taken the time to leave a comment here at this thread. This thread is, however, now closed to comments – because I have other things to do.